Who among us today can claim to have recently visited a real “Shtetl”, like they used to exist in Europe before the Shoah? Who could have imagined going to such a “Shtetl” in a Shiite Muslim country? Did you know that in Azerbaijan there is a region, Guba, that until the end of the 19th century was populated by a large number of Jewish villages, of which the last one, Krasnaya Sloboda, located about 180 km from Baku, still exists today. Did you know that there was never a ghetto in this country and the Jews have always been free to choose where to live? Do you know who the Tats are, and in particular who are the Jewish Tats? So today we have decided to invite you to follow us on a very special journey to discover a unique spot on earth, Krasnaya Sloboda, in the Guba region of Azerbaijan. In this Jewish village, the men and women live their Judaism in joy and tranquility. The journey from Baku is superb, to the right the Caspian Sea, to the left the southern foothills of the Caucasus, the region that geographers refer to as South Caucasus or Transcaucasia (covering Georgia, Armenia and Azerbaijan). After about two and a half hours on the road you reach Krasnaya Sloboda (in Azeri, Girmisi Gazba), a village at first sight just like the others, except that it has no minarets. The reason is simple, the place is only populated by Jews, who number about 5,000. However, before talking about life today in this special place and hearing from regional and municipal leaders and some of the inhabitants about life here and the outlook for the future, a historical summary is called for, however short and superficial. Opinions differ. Some say that the presence of Jews in the Guba region, who are known as Juhuro – Yehudim Harririm – Mountain Jews, goes back to the 13th century, while others reckon that it started with the Exile and the destruction of the First Temple in Jerusalem in 722 BCE. However, the members of this group of Jews do not live just in Azerbaijan, where according to some estimates they number around 10,000. They are to be found in Dagestan as well as in two villages in the North Caucasus, Gorny and Nalchik. Whatever the case, it is certain that in 1742, a local ruler named Falikhan gave the Jews who were being persecuted by Islamic fanatics the right to settle on the other bank of the river at Kudiyal-Chay, the town where they lived. The community, known by the name of Yevreskaya Sloboda (Jewish Town) then enjoyed a fabulous rise. Contrary to their coreligionists in Europe, Jews in Azerbaijan had the right to own land. They in fact did the same work as their Muslim neighbors, farmers, above all in wheat. They also grew rice, tobacco, vines and since they were on the famous Silk Route, they grew silk. Strangely, towards the end of the 19th century around 6% of the Jews of the region gave up agriculture to go into the leather trades, especially tanning. Today they are to be found in every trade available in the area. In 1917, when the Bolsheviks seized power, they banned every sort of private enterprise and herded the Jews and Muslims into collective farms, allowing them, however, to keep up their work and continue their traditional husbandry. For some unknown reason, they renamed Yevreskaya Sloboda to “Krasnaya Sloboda” (Red Town), which had 18,000 inhabitants. According to some, the town has the name on account of its red roofs that give at a reddish appearance when looking down from the hill that dominates it. Others say that at the time of a war or pogrom, the river that divided the Jewish and the Muslim towns ran red with blood. In truth, no one actually knows. It is also interesting to learn that prior to the arrival of the Soviets, the place had thirteen synagogues, all of the same Sephardic rite, of which just one remained active during the Russian occupation, while seven are still extant but given over to other functions (cinemas, warehouses, carpet manufacturing etc). In 1996 the State returned two synagogues to the community, restored thanks to gifts by various donors, and in 2001 the Kuzari, reopened. To help us understand everyday life in Krasnaya Sloboda, the oldest Jewish community in Azerbaijan, we held a joint interview with Boris Simandoyev, the head of the community, who also acts a bit as sage and village elder, and Yehuda Ben Sasson Abramov, the secretary-general, whose joint answers we summarize below. Before talking about the life and future of your village, can you tell us how you define yourselves? Are you Azeri Jews, Tats or Mountain Jews? We are simply Jews proud of living in Azerbaijan. To illustrate our situation, we are profoundly saddened each time blood is spilt in Israel, but we are citizens of Azerbaijan, our motherland is here and we are prepared to die for it. We have no problem of double allegiance, as is the case in certain European countries. As to your question about the Tats, the answer is simple. “Tat” is a name that describes a large part of the inhabitants of the Caucasus who speak a language akin to Farsi. The Jews have a language made up of Tat and some words of Hebrew, Judeo-Tat, which was in fact spoken in Iran, and which the Jews who fled Persian persecution brought with them when they found refuge in the Caucasus. It is in no way a matter of Jewish identity. As to the name, “Mountain Jews”, yes we are those Jews, unique in the world, so much so that some consider us “a phenomenal exception of the Diaspora”. The origin of this name is quite recent, dating back to the Russian occupation of the Caucasus at the beginning of the 19th century. The Tsar had sent an envoy to draw up a report on the various ethnic groups that inhabited the region. In his report he mentioned a group of Jews who lived up in the mountains because they feared pogroms. However, unlike their kinsmen in Russia, they dressed like the rest of the population there, and they could not outwardly be distinguished from the other inhabitants. In order to differentiate them, he gave the title “Mountain Jews”, which we bear up until today with pride. Is life still good in Krasnaya Sloboda? The answer is yes, very much so, despite the fact the we are a Jewish island in a sea of Muslims. Firstly, our town is prosperous. That might seem surprising when one sees the villages round about. You just need to walk through the streets to note that ours are in good repair, and you can see a large number of foreign cars. What’s more, we have two secondary schools, a college, a Jewish cultural center, a small yeshiva run by Rabbi Adam David Davidof where we train our leaders of tomorrow, and an active Jewish life. Even though the population is almost exclusively Jewish, we do not forget that we are living in a country where the separation of Church (or rather Mosque) and State is rigorously applied. We celebrate all the national holidays with the same enthusiasm, joy and determination as our own religious festivals. Despite being a Jewish village, we are governed according to the laws of the land and do not live like some sort of theocratic enclave that is ruled by Halacha, Jewish law, except of course in purely religious matters. It is true that for those who recall the flourishing period when we numbered almost 18,000 souls, seeing our village reduced to 5,000 people might be cause for sadness and even concern. But in fact such is not the case, even though some of us have left for Israel, and many young people have left in search of work in Russia, especially in Moscow, yet we have maintained a calm yet dynamic life here. Of course, everyone knows everyone, and most marriages are between inhabitants of the village, though there are a few mixed marriages when some have found it necessary to marry people from other villages and another religion, but such cases are truly rare. If once we had more funerals than marriages, that is no longer the case today. The figures are almost equal, and some years we have even had a few more weddings. You mentioned two schools; what is the proportion of Jewish studies? These are state schools where 98% of the pupils are Jewish. But they are not really Jewish schools. Each week we provide several hours of teaching in Jewish history and before the festivals we explain their meaning. Religious subjects are not taught in school, even though there are Hebrew lessons. This is because after the Soviets left, each ethnic group could choose the language it wanted to teach to its inhabitants. We chose Hebrew. Everything religious, including preparation for Bar Mitzvah, takes place after school hours. No, but is still spoken within families. 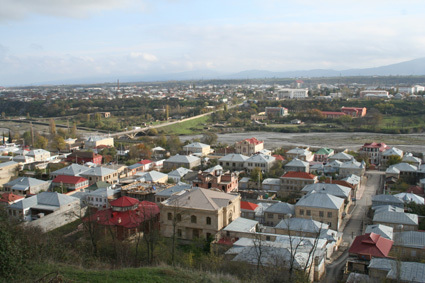 Do you believe there is a future for the Jews in Krasnaya Sloboda? Despite efforts by the Soviets to fully integrate us into the “great Russian nation”, we Jews of the Caucasus have always been able to protect our Jewish identity, retain our traditions such as shechita (ritual slaughter of kosher animals for food), we have circumcised our sons and we effectively only marry among ourselves. The fact that we have survived despite the Soviet yoke lets us contemplate the future with optimism and calm, but without illusions. Some Jews who have left this region think there is no future here, and that in a few years time the last one out will switch off the lights. Do you think they are right? As you know, no one can predict the future. I can say that we live in a country where the Jews in general enjoy a large amount of consideration and complete religious freedom. What ever affects the other citizens also impacts on the Jews. Here, as throughout the country, the economic situation is very difficult and there is a terrible shortage of work. The immediate consequence, whose effect is dangerous enough, is that young people are attracted to the easy money in Moscow and no longer want to start long, difficult studies. You should be aware that a doctor earns very little. We do not believe we have difficulties because we are Jewish or that our Jewish life is under threat, very much the contrary. However, we run the risk of losing members of our community, who in the first instance want to settle in Baku before leaving for Moscow, the USA or Israel. But if the economic situation improves, there can be no doubt that will help to maintain our population. I often hear people who have left saying, “I’ll only come back for the day in memory of the dead (Tisha b’Av) and I will only come back for good to be buried”. That reflects a certain truth, since no one comes here or returns to settle. But you should not lose sight of the fact that people born here are very attached to the place and continue to be so after they have left. Many who have made their fortunes in Moscow and even in China are now building magnificent villas in Krasnaya Sloboda and make large donations to the Jewish and non-Jewish institutions in the village. Thus for example, one of our schools that has over 250 students has been totally renovated, another donor gave a ritual bath, another a wedding hall etc. Moreover, many Mountain Jews who live all over the world return here to celebrate their marriage or that of their children. What about anti-Semitism and Islamic fundamentalism? Clearly, in our own village there isn’t any. Within the region we do not suffer from either of them. It is true that the press is not always pro-Israel, but overall we do not think it is worse than in Europe. As to Islamic fundamentalism, for the time being it has not gained a foothold and even the Azerbaijan Islamic party has hardly any members – at least for now. To sum up, we can say that a journey to Krasnaya Sloboda cannot leave anyone untouched. We were struck by the fact that the streets are above all full of very elderly men and women. In looking into things, we learnt that in accordance with local traditions, a woman’s place is in the home. They go out when the husbands permit, never go to a café, even with lady friends. If they go out to a restaurant, it is with the entire family. From the age of 15, the girls gradually drop out of school, in order to get ready to get married young. There are very few girls who go on to higher education. Incidentally, even those who do, when they marry and come back to Krasnaya Sloboda, take up again the life, the family traditions and their place in the home. The question is how long will that type of lifestyle be able to continue when faced with the demands of modern life. The fact is that today, from that point of view nothing has changed for the Mountain Jews, who definitely deserve to be visited, because they are warm, friendly and intelligent, and they bear their identity and their historical and religious heritage with pride. In a word, they are our kin … the sort of family one likes to have!